It is a well known fact that x-rays are frequently a vital step in the diagnosis of all manner of problems, from broken bones to cancer. What is less widely known is the vast improvement that digital x-rays have over x-rays of years gone-by. The increase in detail that digital allows us to see, the ability to manipulate the size and contrast of images post-exposure, and the ability to easily transmit our images to a board certified radiologist when needed, have helped us to help your pets even more than we could for so many years with “plain” x-ray technology. Our state-of-the-art digital system has been a hugely important improvement in our diagnostic armamentarium. Fountain City Animal Hospital has also recently replaced our tried and true ultrasound unit (we joke about how we wore the old thing out!) with a brand new improved unit that allows for even better and more complete imaging of the internal architecture of your pet’s abdominal organs and heart. 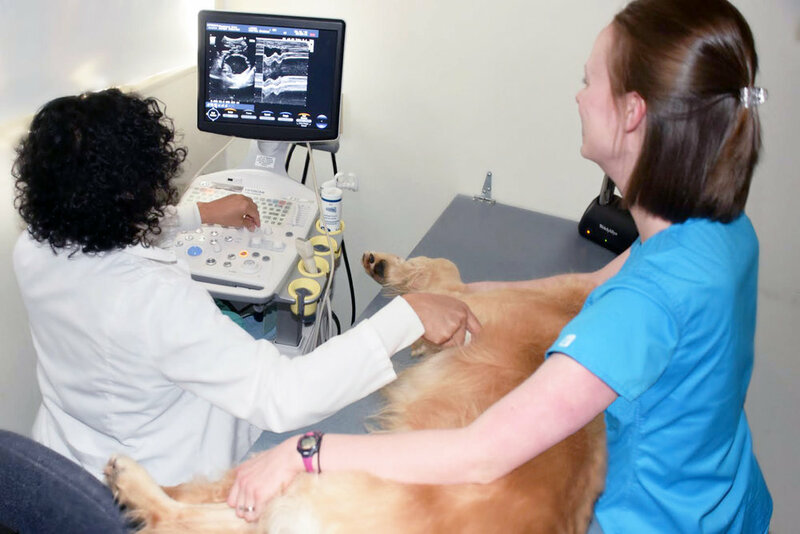 Abdominal ultrasounds and echocardiograms are common components of our medical work-ups on a variety of problems, from pancreatitis to mitral valve insufficiency. We also use our ultrasound machine to guide us in aspirating internal masses for cytological examination and even to obtain urine samples straight from the bladder of dogs and cats.